Working together is not exactly a new concept to agriculture in Alberta. The vast majority of agricultural producers are willing to drop whatever they are doing if a neighbour, friend or family member needs a hand. There are also producers in Alberta who have found it benficial to take things one step further by creating a co-operative with other producers. 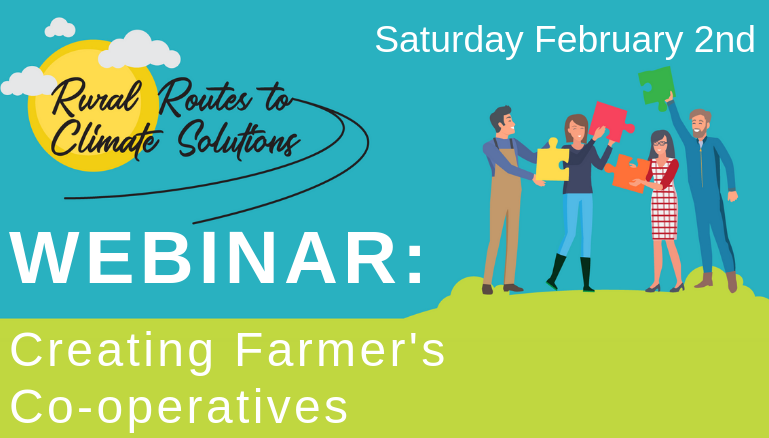 Rural Routes to Climate Solutions has partnered up with the Alberta Community and Co-operative Association (ACCA) to host a webinar for agricultural producers to learn how to form their very own co-operative that will help producers save on costs and minimize their environmental footprint. Co-operatives that can benefit producers come in all different shapes and sizes—consumers co-ops, producers co-ops, land management co-ops, energy generation co-ops—and we’ll take you through the steps of designing the co-op that will work for you. Alberta Community & Co-operatives Association will go through what you need to consider before forming a co-operative (also when not to form a co-operative) and how to get it done. Then we’ll have lots of time for Q&A and group discussion. If you and other producers you knew have been toying with the idea of establishing a co-operative for some time now, this webinar is a perfect opportunity to test that idea. Bring yourself, bring them and find out if a co-operative is a good fit. And as a bit of pre-webinar homework, be sure to listen to our Farmers Co-ops 101 podcast episode with Seth Leon of the Alberta Community & Co-operatives Association. The Alberta Community and Co-operative Association is a not-for-profit co-operative working for the education, development and promotion of co-operatives across Alberta.